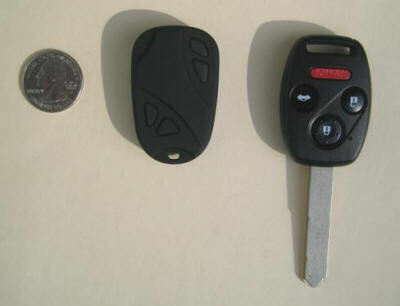 The #1 is one version of the 808 car keys micro camera. Here are a couple of component maps for the #1 Camera. Click for full size. I don't have a schematic, bill of materials or artwork. A big piece of the #1 camera puzzle has been solved. I received an email from Masato. He has directed me to new BIN files for the #1 camera that removes the date time stamp, and reduces the duplicate frame rate! I have installed the new bin files on my #1 camera and they work. I hope that they work on your #1 camera. You can choose to continue to use the current font file and have the video date time stamp overlay, or replace the font file with the blank font file and have no overlay. 1. VIDEO DATE TIME STAMP REMOVED - A new DynamicFont4_16.bin file has a font that is blank. This completely removes the video date time stamp overlay. The video upper left corner has no date time stamp artifacts. Even if you remove the video date time stamp, you still want to set the date time with the time.txt file because the AVI and JPG files are stamped with the date time. Some people have reported that setting the date time has fixed some unusual video length problems. 2. FRAME RATE 15 FPS, LOW DUPLICATE FRAME RATE - The frame rate in the AVI file has been reduced from 25 FPS to 15 FPS. This is good because the processor could not keep up with 25 FPS and generated many duplicate frames. The duplicate frame rate has dropped dramatically from about 12 per second to less than one per second. A new test AVI file contains 121 frames (8.07 seconds). The first 7 frames are duplicates. Then there are 4 more random duplicates in the file. Ignoring the initial duplicate group, that's 4 duplicates in 114 frames (7.6 seconds) or much less than one duplicate per second. That is a lower duplicate frame rate than a #3 camera. If you have a Windows computer, use the Anyka burntool to update your #1 camera. After the update, to disable the video date time stamp, overwrite the camera DynamicFont4_16.bin file with the blank font file. If you have a Mac or Linux computer and can't run a Windows application, use the following procedure to update your #1 camera. Use these files at your own risk. They work in my #1 camera. These are the new bin files. Use this "DynamicFont4_16.bin" file to enable display of the date time stamp overlay. There is just enough room in the bin partition for one copy of these files. Use this file at your own risk. It works in my #1 camera. Use this file to disable display of the date time stamp overlay. Replace the DynamicFont4_16.bin file on the camera with this blank font file. Put your camera into system mode. Backup the camera bin files (in case you want to restore them). Replace the old bin files with the new bin files. The new files go in the camera's first partition where the bin files are. If you want to disable the date time stamp use the blank font file on the camera. It is important now to reset the camera. 22 Nov 2009 - How to raise a #1 camera from the dead! 3 Jan 2010 - Use these bin files - they are newer and work great on my #1 camera. No need to press reset after each video. A camera owner named Michael from Germany emailed me about how he restored his dead #1 camera. He used system mode, reformatted, and restored the system files. "The data was corrupted, probably because the camera overwrote part of the memory when it went past 4GB. Now that it's reformatted to 4GB, it obviously doesn't do that anymore." "I suspect the memory organization of the #1 cam looks something like this: system | system | data"
"The first two partitions are obviously hidden unless you're in system mode. The firmware thinks there's 8GB of memory, so the cam continues to write past the 4GB point and overwrites the two system partitions with video data." "This also what happens with all these counterfeit 32GB flash drives. You can write 32GB of data to them just fine, and the file system will show all the files are there, but it actually just overwrites the same 2GB (the actual capacity of the memory chip) 15 times, so you just get garbage data if you try to access the first 30GB." I originally tried this and it didn't work because my system files were corrupt. I used his system files Use these bin files. and now my camera works. 1. Use system mode to boot your camera. The flash memory contains three partitions. Windows should load a drive letter for each partition. On my computer Windows opens the drives in this order: BIN files, SYSTEM files, then USER files. The drive letters depend on your computer configuration. Write down which drive has the *.bin files. Your files are probably corrupt, but save them to your computer drive, just in case you want to restore them. 2. Use Windows to reformat each camera drive. Run Windows check disk on each camera drive and select "automatically fix file system errors" and "scan for and attempt recovery of bad sectors". After formatting, your camera drive might report a smaller size (correct size) like 4GB instead of 8GB. This is normal because the flash was deceptively reporting the wrong size. 3. Download key cam.zip (4520012 bytes) and upzip the files to the correct camera drive. Use these bin files. 4. Disconnect the USB cable, press the reset button, and try your camera. It should work. Mine did. If your flash is faulty, I don't know how long this fix will last. Good luck. I hope this procedure works for you. My restored camera is much better than dead, but not fully functional. Here is an inventory of what works, and what does not. I can set the date time using the time.txt file. I can take an unlimited number of still images. I can turn the camera on, and off. When I connect the camera Windows installs it as a mass storage device. After each video I must press reset. When the camera is on, if I press and hold the mode button, the LED flashes three times, the LED goes out, the camera takes video. When I press the mode button to stop the video, the video stops (the AVI file is OK), but the LED does not come on. No buttons respond. The camera is not functional until I press reset. When you use the latest bin files you camera should be fully functional, except for any problem caused by bad flash memory. USA Quarter Video Camera Car Key My #1 camera must be in this vertical orientation to take right-side-up images. Some #1 cameras require horizontal orientation. CLICK FOR FULL SIZE - Tear down of #1 camera showing the clam shell design held together with two screws.. Note that the microphone is not aligned with the hole in the case. These sample videos were taken with a #1 camera. This camera produces an MJPG, 640x480, 25 FPS AVI video file. About 1/2 of the frames are duplicates, hence the jerky stuttering motion. The firmware can be upgraded to15 FPS, which is much better. Sample video, camera #1, outdoor lighting, stationary, 20 seconds. Sample video, camera #1, indoor lighting, hand-held, 22 seconds. OVERALL IMPRESSION - Once you figure out how it works, and understand it's limitations, it works amazingly well. It is useful as a "webcam" quality micro video camera, a good quality audio recorder, a toy quality photo camera, or an 8GB flash drive. At 15 grams it is light enough to be build it into an RC plane, car, boat, or even a model rocket. MISLEADING CLAIMS - Claim: 1280x1024 photos. The native CMOS resolution seems to be 640x480. Still images are up scaled to 1280x1024 in the JPG file. Claim: 30 fps video. The native fps is about 12.5 and the AVI fps is 25. Claim: 2 hour record. The flash might hold that much but the rechargeable battery is out at about 50 minutes of video. DOCUMENTATION - The documentation is a legendary example of broken English and is barely understandable. 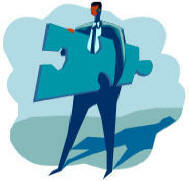 With intuition and trial and error you can figure it out. AUDIO - The video mode records audio. There is no "audio only" mode. The audio quality and recording levels are good and not over modulated, so consider using the video mode as an audio recorder. VIDEO - The color video quality is like a cheap webcam with video noise and a slow shutter that results in motion blur. Because the camera has so little mass, hand held shake is severe. It's best to use it on a solid surface. The native frame rate seems to be about 12.5 fps and each frame is duplicated to 25 fps in the AVI file. The automatic video exposure works and is optimized for indoor light or a cloudy day. In bright outdoor light the video is over bright and washed out. The small date time stamp in the upper left corner of the video can not be disabled. The total AVI bit rate seems to depend on the video content. I'm still studying that. PHOTOS - There is a very slow shutter and an huge lag time. The still image resolution is 640x480 and is up scaled to 1280x1024 in the JPG file. 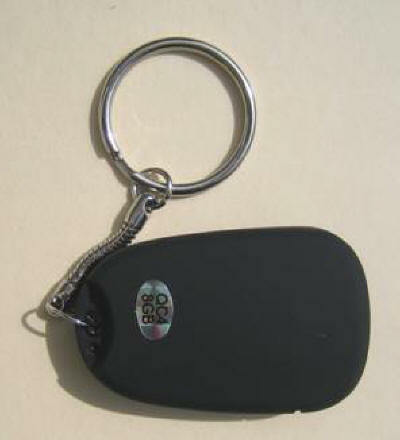 PHYSICAL DESCRIPTION - The camera is in the form factor of a key fob and comes with a key chain (detachable). 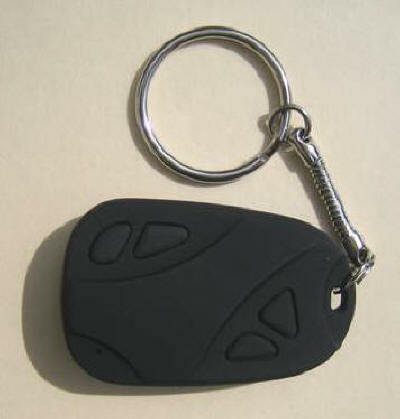 The finish is flat black plastic, with no manufacturing name or text of any kind on the surface. There are 4 un-labeled buttons. Two are real and two are fake. The lens and microphone are on the end of the fob opposite the key chain, and are behind a 3mm and 1mm hole respectively. The included manual does not document the reset button 1mm hole in the side. There are two Philips head screws at the key chain end that hold the top and bottom halves together. The camera is very light at 15 grams, and the key chain weighs 4 grams, so camera and key chain together weigh 19 grams (about 0.7 OZ). The camera is 50mm x 32m x 13mm (2” x 1.25” x 0.5”) . Battery Charge Time from USB "Charge time about 2 hours" If fully discharged (3.6V) slightly less than one hour. The video and images are right-side-up when the buttons are on the left. If the buttons are up, images will be rotated 90 degrees counter clockwise. Sensor resolution seems to be 640x480. The codec is MJPG (Motion JPG). The native FPS is about 12.5 and is up scaled to 25 fps in the AVI file (each sensor frame is duplicated in the AVI file). 2596000 bits per second, but this is variable and depends on the frame content. The audio part of the AVI is PCM uncompressed, Mono, 16 bit, 8000 samples per second (128000 bits per second). The AVI file has one video stream and one audio stream. Example AVI file rates - The amount of compression in motion JPG depends on the frame content. 20 to 33 million bytes per minute. 1.2 to 2.0 billion bytes per hour. The sensor resolution is 640x480 and is up scaled to 1280x1024 in the JPG file. Like the video mode, the image mode can't resolve more than 213 horizontal checkerboard squares, so this confirms the up scaling from 640x480. JPG, each file is between 250K bytes and 450K bytes. Similar to a 120 mAh Hyperion G3 LiPo, CX 25C type, LG325-0120-1S, Size including lead length (mm) 30.6 x 20.1 x 3.6. Weight 3.73g. 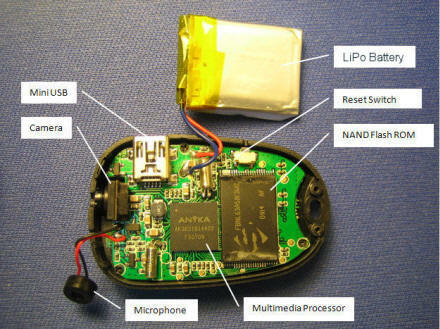 The shape, voltage and micro protection circuit board on the battery would indicate that this is a rechargeable LiPo battery. Nirtocharged on the parallax forum revealed this secret about the #1 camera that I didn't know. This works even on my dead #1 camera. 22010 Feb 22 - #1 Camera, Driver for the Anyka Burntool. Hardware ID (0471 0666). Bootstrap and 0471 0666 update from 2009 Nov 04. The following procedure is for the #1 camera only. Do not run the burntool on any other type of camera. 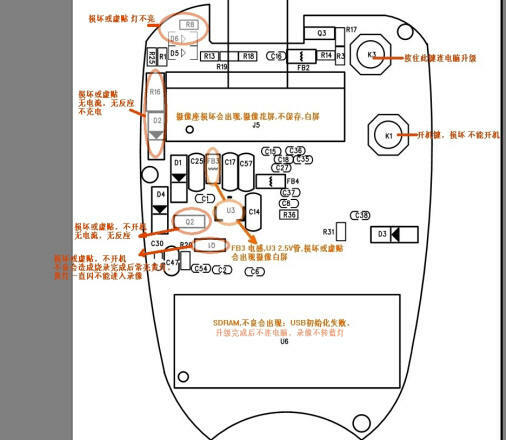 BURNTOOL -Burntool will load the firmware into the flash of the #1 camera . I think it also installs some BIOS files into the ANYKA processor flash. 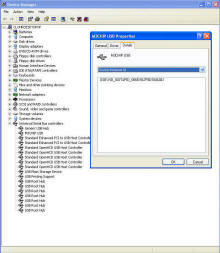 M3USB - Download the M3USB driver (hardware ID 0471 0666). It interfaces the the Anyka "burntool.exe" program to the #1 camera in burn mode. 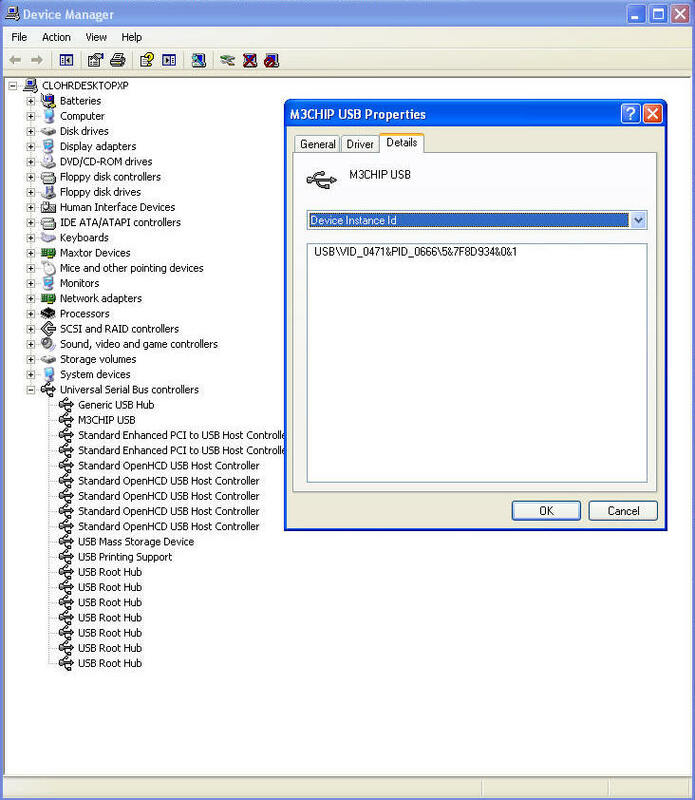 M3USB installs as a USB controller "M3CHIP USB". BURN MODE - To use the burntool and the M3USB driver, the #1 camera must be in burn mode. To get into burn mode - Start with the camera and the LED off. Press and hold the mode button, then connect the USB cable. Release the mode button. Windows will either ask to install the M3USB driver, or use it if already installed. Download this file. It contains the firmware for the #1 camera and the burntool (about 5 megabytes). 611_VGA_V1.06 (with time) 4_16sdrm.rar. PROCEED AT YOUR OWN RISK. YOUR CAMERA COULD BE UNUSABLE IF THIS PROCEDURE DOES NOT WORK FOR YOU, OR YOU USE THE WRONG FIRMWARE. Here are the steps I followed to burn the software into the #1 camera using the Anyka burntool and the M3USB driver. This worked for me. I am using Windows XP 32 SP3. If you stop halfway, the camera and system mode will not work, and you have to start over. Backup any camera AVI, JPG or system files before doing the following. Everything on the camera gets erased and reprogrammed. My camera was sold as an 8GB camera, but it has a 4GB flash chip. If your flash size is different, you might get different results. 1. Connect the camera in burn mode (see above). If windows asks for a driver, manually select "M3USB folder". Windows will install the M3USB driver. 3. Run burntool.exe from the 611_VGA_V1.06 folder. 4. Connect the USB cable in burn mode. 5. You will see a yellow status square on the burntool screen. This indicates burntool sees your camera. 6. Press the burntool green start arrow button. 7. Burntool has a blue progress bar and a timer. My burn took 3 minutes 37 seconds for a 4GB camera. Wait. 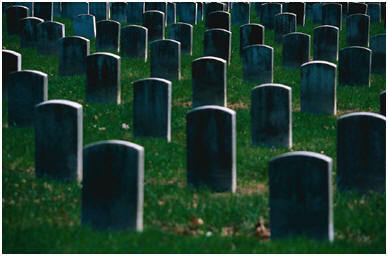 If you abort here you will have to start over. 8. When done, the burntool status square and the progress bar turn green. 9. Disconnect the USB cable. 10. Reset the camera and try it. In one place on the internet VID_0471&PID_0666 is a “Philips PDIUSBD12 SMART Evaluation Board”. See below. 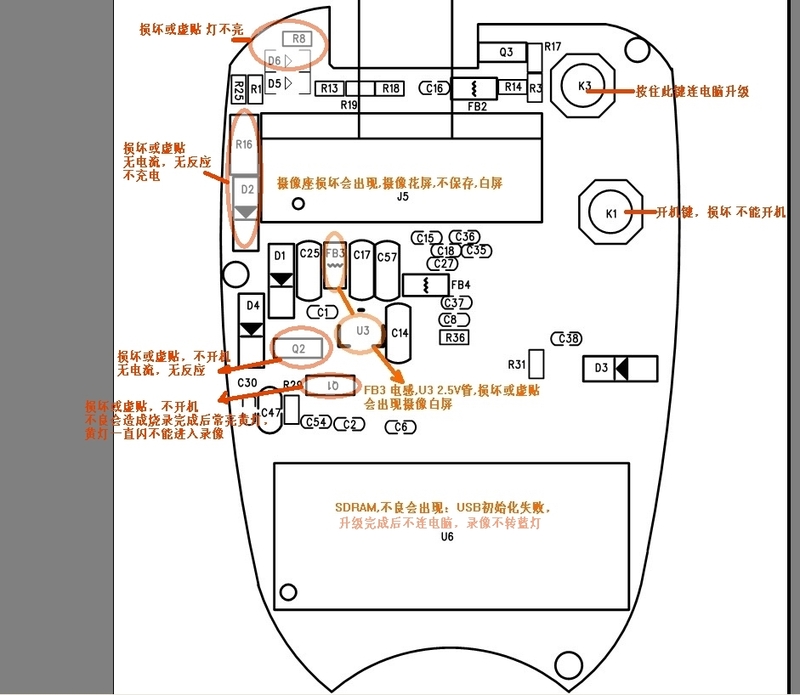 "DeviceDesc"="Philips PDIUSBD12 SMART Evaluation Board"
BOOTSTRAP MODE - Bootstrap mode does not seem to have any purpose. It makes Windows look for a hardware ID driver of (vid pid) 0000 0000. To get into bootstrap mode: Start with the camera and the LED off. Hold the mode button down and press the power button. Then release both buttons. Then connect the USB cable. Windows might acknowledge a new USB device and try to load a driver for hardware ID 0000 0000. Windows will not find a driver. Thanks to M.D. for this driver information. The #1 camera uses the USBAnyka Driver. The hardware ID is 04D6 065E. The webcam operates at 320x240 on my computer. Verified to work with with Skype and VirtualDub. If your #1 camera has failed, try system mode, and run the H2testw program on the flash memory to see if it is bad. This test can take hours to run. Reformatting the drive is not a good flash test. I was able to revive my dead #1 camera. 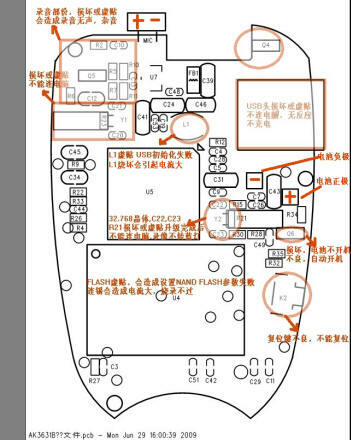 There is a huge counterfeit flash memory scandal going on concerning products from China that are often sold on eBay. My #1 (8GB) camera failed because a 4GB (32 gigabit) flash chip that did not pass quality control (QC) was reprogrammed to look like an 8GB part and used in my micro camera. These parts should have been scrapped. 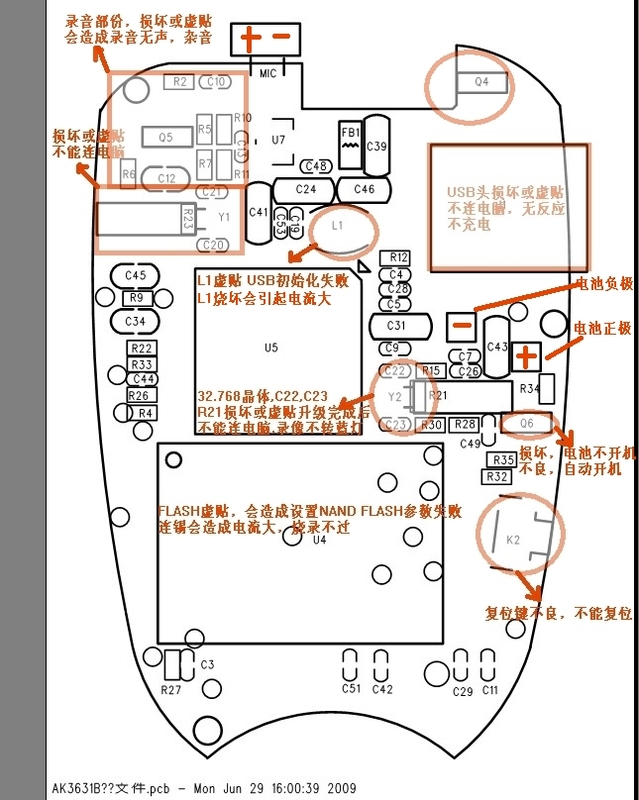 Many products containing bad flash have been sold on eBay. These products include USB flash drives, SD flash cards, MP3 players, and micro cameras. I bought an 8GB #1 camera from an eBay seller xprodeal in China. When new, Windows reported my #1 camera to be an 8GB mass storage device though I never put more than 4GB on it. As I reported in my tear down video, this camera has a SpecTek FBNL63A51K3WG-AF flash chip in it. That is a 32 gigabit (4 gigabyte) chip. I never raised a flag about the fact that a 4GB flash chip is being used in my 8GB camera, and I should have. The camera failed on October 19 2009. Since then, when the camera is connected to the USB Windows does not see it. I went into system mode and successfully reformatted the flash. Now Windows reports the flash to be 4GB. My #1 8GB camera is dead. It worked from Sept 22 2009 to Oct 19 2009. ● When the USB is connected the LED comes on but the camera will not connect . Tried with 2 different computers and 4 different USB cables. ● The power button turns the LED on and then the LED blinks 2 seconds later, but then the buttons don't work. ● The reset switch turns the LED off. ● Even though dead, I can still access the flash by using system mode. I have a #3 camera on order, so I will review that when I receive it. Received 2 Nov 2009. I now know why my camera died. It has a bad flash chip. I was able to fix my camera. Here are the instructions.